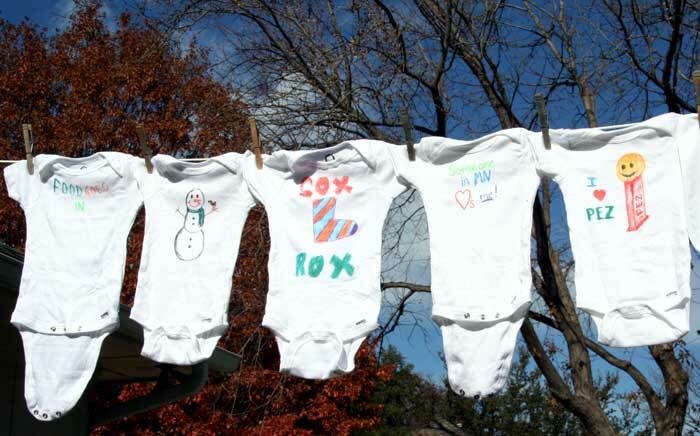 First, we purchased a few packages of the common white onsie in three different sizes (0-3 mo, 3-6 mo, and 6-9 mo). We didn't want to do all this work, only to have our child grow out of the kewl clothes so soon. 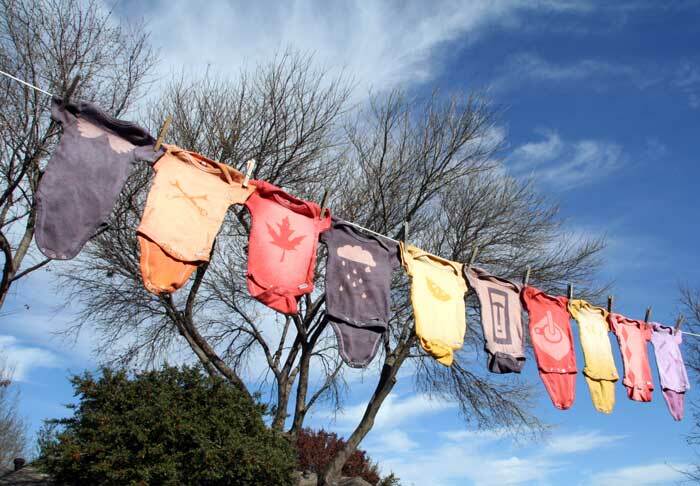 Two comments for future dying: (1) use two packets of dye for richer colors, and (2) use the washing machine method, instead of buckets – there'll be a lot less mess to deal with and the dye will take more evenly to the clothes. We didn't stop once we had some color on them! Our friends Stina and Jesse came over and helped us kick it up to the next level of awesome. 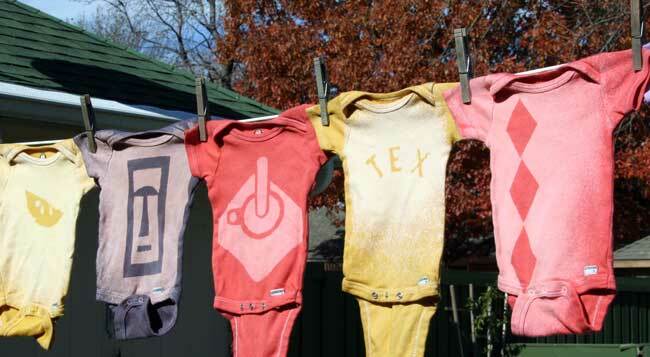 Following Make's instructions on bleach stenciling, we rounded up a random assortment of items and a spray bottle of 50/50 bleach and water mixture. This was so fun and easy to do. Like many a craft project, it's tricky to brainstorm the first idea or two, but once you get started you're spurred on by the possibilities. Tools (wrenches), card-board cutouts, leaves, fridge letter magnets, a "wings" pin from an airline, and all sorts of household items were used to make our stencils. The selected item blocks the bleach (although there's some bleed), and you watch it until the dye fades to the desired lightness. Some colors, like black, don't fade to gray, but to an orange color instead. Also, you want to be careful on how light you let it get, as the bleach can start to "eat" the cloth. 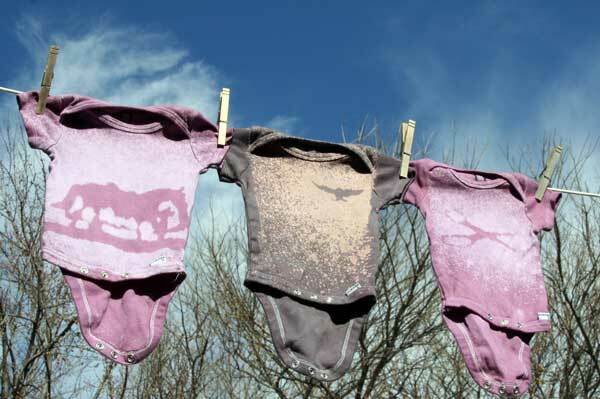 Which is why this craft is great for babies/kids: they grow out of their clothes so quickly that you can (hopefully) retire the shirts before they wear holes in it. We are very pleased with the results of our craft. 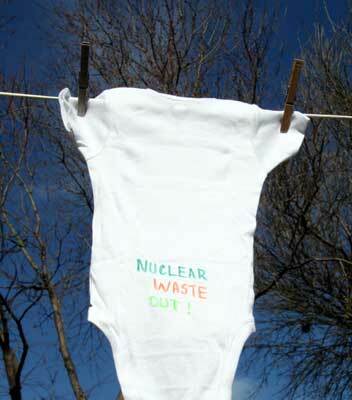 Although not an official Crafturday, we had fun making and doing, and our child is gonna rawk in these duds. 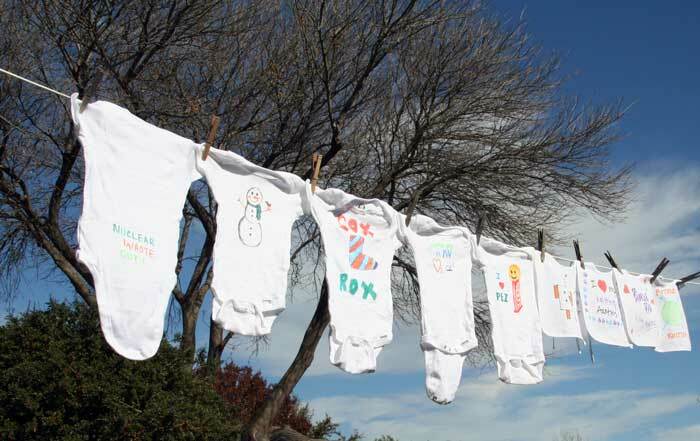 And if this don't beat all - at my last shower (baby, not washing), Rachel and Chris pulled out a couple packs of white bibs and onsies and a pack of fabric markers. 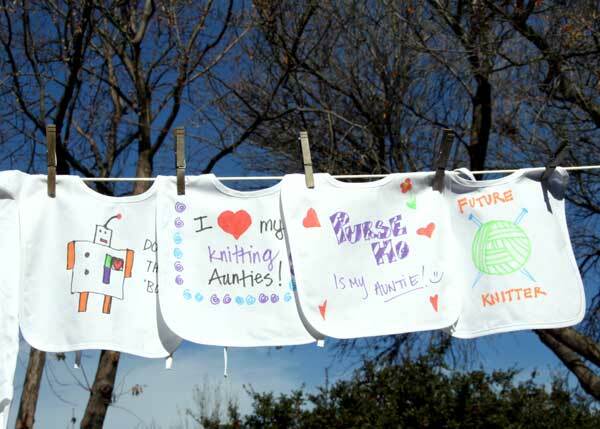 The knit grrls each drew or wrote on an item for the babe. I'll heat set the ink with a few minutes under an iron, and we should be golden! I can't wait until I can stuff my lil' pumpkin into some of these outfits. Very clever, very fun, very awesome! Cheerio is going to be decked out!!! 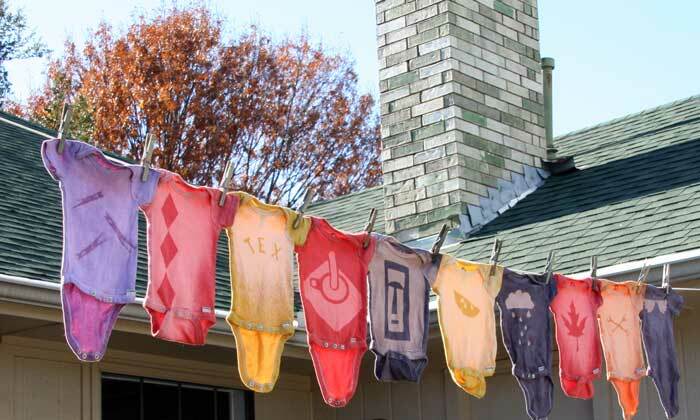 That's extremely crafty - and smart - of you to do something so fun for your bebe. i love the onesies. you guys are so clever! So fun! You guys are so clever and fun! Cheerio is gonna be one stylin' bebe! What a great idea...and everything came out so cute! I (the seriously less crafty) just bought tye-dyed onesies at a craft show two days before my daughter was born.